SMS has long been limited to just plain text. RCS (Rich Communication Service) upgrades messaging with popular chat features like typing indicators, read receipts, high-quality photo sharing, messaging over Wifi and more. Google is partnering with carriers and OEMs globally to upgrade the native messaging experience in Android with RCS. Google is now working with mobile services companies like CM, to bring RCS business messaging. With RCS business messaging, businesses will be able to move beyond pure text messages to create branded, interactive messaging experiences. By joining Google’s Early Access Program for RCS business messaging, CM will be among the first to bring this enhanced messaging experience to our customers. RCS will upgrade today’s business messaging experience by enabling brands to send more useful and interactive messages. 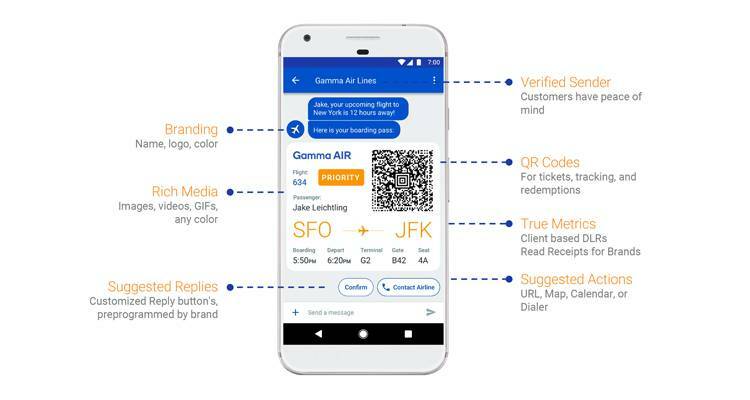 For example, messages from airlines reminding people to check in for a flight can now take advantage of rich media and interactivity to provide a full check-in experience, complete with boarding pass, visual flight updates, and terminal maps on demand, all directly within the messaging experience. RCS business messaging uses RCS (Rich Communication Services) to upgrade business SMS with rich media, interactivity, branding and better analytics. With RCS business messaging, businesses can engage mobile customers in new ways with more useful and dynamic messages. SMS is dead? Guess again! SMS is something we all know. It has been part of our lives for decades. Therefore, SMS might come across as old, but it has found a renewed purpose. It might potentially change the way we text forever. Let’s see how we get to SMS 2.0.